The three major Wall Street indices scaled record highs again, with Dow up 0.3%, the S&P 500 adding 0.2% and the Nasdaq inching 0.1% higher. Sydney: Asian shares rose on Wednesday, tracking Wall Street's rally to all-time highs, while the euro hovered near a 10-day peak after Catalonia's leader talked down immediate plans to secede from Spain, easing near-term concerns about euro zone instability. MSCI's broadest index of Asia-Pacific shares outside Japan nudged 0.24 percent higher to test a recent decade peak of 545.56. Australian stocks jumped 0.6 percent to one-month highs and New Zealand's index climbed to a record. 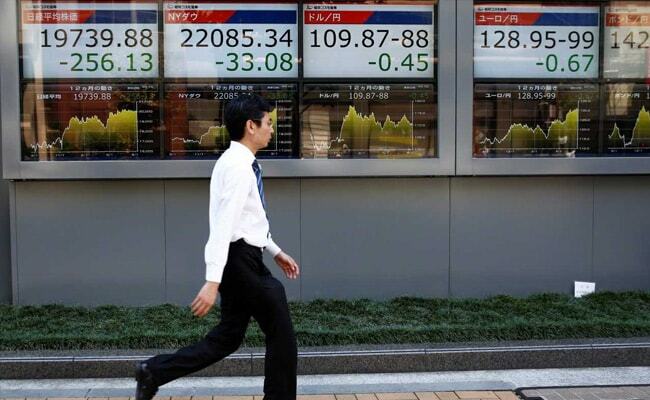 South Korea's KOSPI added 0.3 percent to a 2-1/2 month peak. The three major Wall Street indices scaled record highs again, with Dow up 0.3 percent, the S&P 500 adding 0.2 percent and the Nasdaq inching 0.1 percent higher. Japan's Nikkei was a touch softer at 20,807.39. In currency markets, the euro held gains around $1.1816, not far from Tuesday's high of $1.1825, after Catalonian President Carles Puigdemont called for talks with Madrid to discuss the region's future. The gesture tempered fears of immediate unrest in a major euro zone economy and cheered investors. Madrid's IBEX 35 Index futures added 1.1 percent, after the cash IBEX stock index closed down 0.9 percent on Tuesday. "Markets were on edge, and no doubt so was he," said David Plank, head of Australian economics at ANZ Banking Group, referring to Puigdemont's address at Catalonia's parliament. "But the declaration for independence did not come, at least not explicitly," Plank said. "This issue remains extremely fluid. But one thing is clear - this is not going to go away quickly or quietly." The dollar continued to lose ground with U.S. President Donald Trump's escalating war of words with Senator Bob Corker raising concerns about the administration's ability to pass promised reforms. The dollar index fell to 93.22, against a basket of currencies, to the lowest level since Sept.29. The greenback was also under pressure amid ongoing uncertainty over the next Federal Reserve Chairman, with the predictions market site, PredictIt, favouring Fed governor Jerome Powell as the most likely candidate. Investors will keep an eye on the minutes of the Fed's September meeting due later in the day, which might help bolster views of a December rate hike. U.S. Treasuries pared gains on news out of Spain as a risk-on mood kicked in. Treasury futures were down 4 ticks in early Asian trade. In commodities, U.S. crude was last off 2 cents at $50.90 per barrel and Brent eased 8 cents to $56.53 after rising on Tuesday following export cuts by Saudi Arabia. Gold prices hovered near their highest in two weeks against the backdrop of a weaker dollar, with spot gold up 0.18 percent at $1,289.61 an ounce.